or off-road beast with our lift kits & combos! 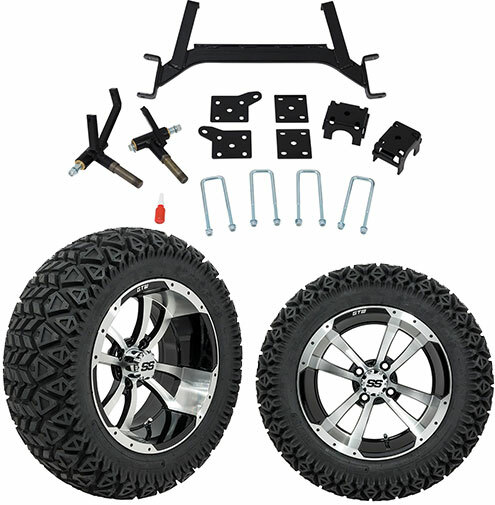 Raises the body off the frame, to clear larger wheels and tires. Budget-friendly option. Modified spindles give the golf cart extra ground clearance and a wider wheelbase. Equal to a spindle lift, but designed for many E-Z-GO carts where spindle lifts cannot be used. 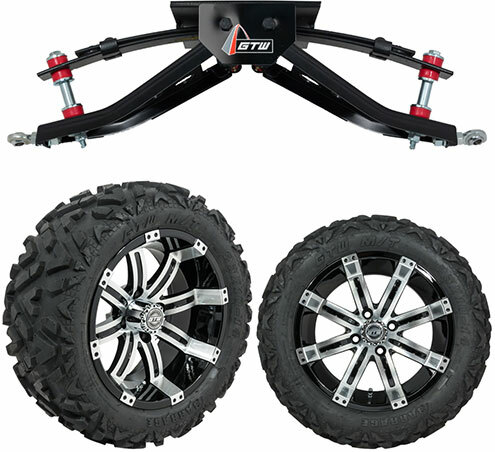 Combines a spindle lift with an all-new front suspension for more lift and off-road performance. The ultimate lift kit! Heavy duty tubular A-Arms and coiler front springs handle the really tough stuff. These combos are designed to handle the tough stuff, and feature several styles and finishes of GTW wheels to choose from. Available with your choice of 12" or 14" wheels. These combos offer a great blend between light off-road performance and on-road manners. Available with your choice of 12" or 14" GTW wheels, in a selection of colors and finishes.